"No secret stays hidden forever..."
A phone call from an old friend sets Dr. Giovanni Vecchio back on the path of a mystery he'd abandoned years before. He beer expected a young librarian could hold the key to the search, nor could he have expected the danger she would attract. Now he and Beatrice de Novo will follow a twisted maze that leads them from the archives of a university library, through the fires of Renaissance Florence, and toward a confrontation they never could have predicted. 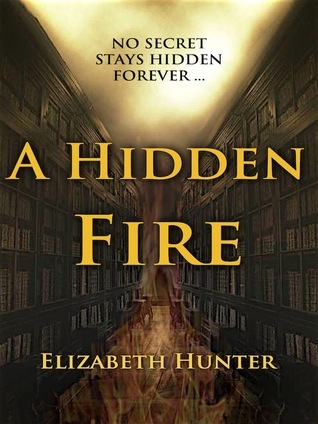 First off, thanks to the author for sending in a copy of A Hidden Fire for us to review. At first, I didn't really know what to expect from this book since I've never read a lot of adult fiction. But honestly, I was pleasantly surprised. Adult fiction didn't have too many differences with YA novels except for some mild sexual content. But at the same time, I was also super excited to read this novel since it was a paranormal/fantasy novel. This book was a little bit of both fiction and non-fiction since it included a little bit about the history of the Italian Renaissance. The beginning wasn't exactly exciting for me, in fact, it didn't spark any interest for me at all. But I knew I had to patient with it, since not all great books have great beginnings. As the story start to progress, and things started to happen, I started to really enjoy this book. The vocabulary and detail in each page was written so well, it was like watching a film instead of reading a book. The humor in this book lightened up the story and made it exciting AND fun. And who says the elders can't find love? Caspar and Isadora? By far the cutest couple in all the books I've read. As for the characters... Beatrice wasn't my favorite character, but I didn't hate her either. She's clever, bold, yet she would let her emotions take the best of her. But I could see where she got her boldness and cleverness from. Isadora, Beatrice's grandmother was definitely an interesting and witty character. Beatrice and Giovanni had this sort of relationship that was frustrating. Because Giovanni was a vampire, he had to learn how to control his urges, which is why he couldn't get too close to Beatrice, even if it meant driving Beatrice insane. But then again, it's not everyday you see a 22-year old female being attracted to a vampire that was over 500 years old. After all the action happened and the mystery started to unravel and things were explained and I was no longer confused, it was already close to the end of the book. With an ending like that, it's impossible to not read the second book of the Elemental Mysteries series. I had all these questions going through my mind after I finished reading A Hidden Fire; what's going to happen to Lorenzo? What about Beatrice and Giovanni's relationship? Ms. Hunter sure knows how to keep her reader's guessing. First Sentence: "The man stole down the hallway, his footsteps echoing in the dimly lit basement of the library."